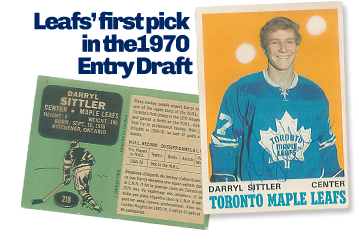 Born in Kitchener, Ontario on September 18, 1950, one of eight children in the Sittler family, Darryl became one of the star players of the Ontario Hockey Association’s London Knights. Few players in Toronto Maple Leafs history captured the imagination of hockey fans, and a place in their hearts, like number 27, Darryl Sittler. Selected as the Leafs’ first pick and eighth over-all in the 1970 Entry Draft, Sittler’s offensive exploits began to shine during his third-season in the league when he scored 77 points. At the age of 24, he became the second-youngest captain in team history. In 1976, Sittler would achieve legendary status, not only in Toronto, but across Canada and the hockey world. It began at Maple Leaf Gardens on February 7, 1976 in a game against the Boston Bruins. While centering a line with Lanny McDonald and Errol Thompson, Sittler scored 10 points (six goals and four assists) and set an NHL record for the most points in a single game—a record that still stands today. 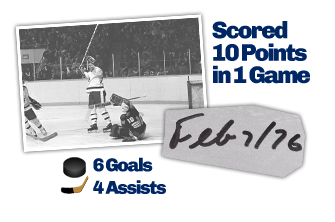 That record-breaking moment helped Sittler become the first ever Maple Leaf to reach 100 points in a single season. Later that April, Sittler’s sensational scoring streak would continue in the Stanley Cup playoffs when he scored five goals in a single game against the Philadelphia Flyers, tying a playoff record. Nearly five months later, on September 15, 1976, during the Canada Cup final at the famous Montreal Forum, Sittler cemented his standing in Canadian hockey lore. Taking a pass from teammate Marcel Dionne in overtime, he beat Czech goalie Vladimir Dzurilla on a partial breakaway, scoring the tournament winning goal for Canada and securing his place as a national hockey hero. In 1989, Sittler was inducted in the Hockey Hall of Fame after retiring from the National Hockey League in 1985. 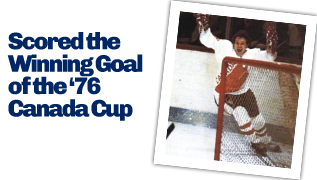 In his career, he played for the Toronto Maple Leafs (1970-1982), the Philadelphia Flyers (1982-1984), and the Detroit Red Wings (1984-1985). Sittler spent the first 11½ of his 15 NHL seasons with the Maple Leafs. He finished his career with 484 goals and 1121 points. Sittler set an NHL single-game record that still stands by getting 10 points (six goals, four assists) in a game against the Boston Bruins in 1976. On February 8, 2003, in a touching tribute to an illustrious career, Sittler was honoured prior to a home game against the Montreal Canadiens. The organizers proudly raised a banner to the rafters of the Air Canada Centre (ACC) with Sittler’s name and jersey number 27. His banner was added to the gallery of other Leaf greats already hanging in the ACC. In a very moving ceremony, Sittler, with his three grown children at his side, paid tribute to his wife Wendy, who had died of cancer the previous year. In 2010, Vancouver songwriters Dan Swinimer and Jeff Johnson wrote a country song commemorating Sittler’s 60th birthday called “The Darryl Sittler Song” whose lyrics help depict the biggest highlights of Sittler’s hockey career. 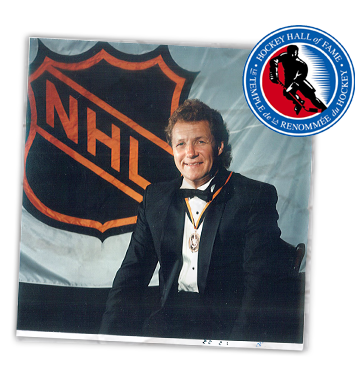 In 2012, Sittler became part of the Ontario Sports Hall of Fame (OSFH) and recipient of the Sandy Hawley Community Service Award. 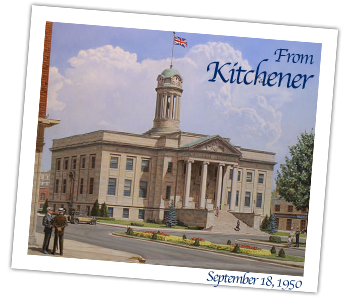 This award is presented annually to an individual who best exemplifies dedication to the community. In true Sittler charitable fashion, he turned around and dedicated his Sandy Hawley Award to the folks who provide the heart, soul, and backbone for all the charity organizations to which he lends his time—the volunteers. Sittler was added to the prestigious Maple Leafs’ Legends Row in 2014. Legends Row is an exhibit outside the ACC that pays tribute to the men who helped make the Toronto Maple Leafs one of the most iconic clubs in sports. The shrine of bronzed lifelike statues in Legends Row is what Leafs Nation was built on and is dedicated to preserving its legacy. It’s an opportunity to build a strong connection between fans of all ages and these legendary stars. Legends Row is an honour that will be bestowed upon only a select few throughout the Leafs storied history. Sittler was inducted into Canada’s Walk of Fame on August 23, 2016. He was among six inductees who were honoured at the Allstream Centre and earned stars on Canada’s Walk of Fame in Toronto. Sittler, who retired from the NHL in 1985, played 844 games for the Maple Leafs over 12 seasons. He recorded 389 goals and 916 points in that time and wrapped up his career as the Leafs’ all-time leader in goals and points. To this day he still holds the Maple Leafs career records for hat tricks (18) and the longest point streak (18 games) and was the first Maple Leaf to record 100 points in an NHL season. In September 2016, Darryl Sittler became part of a six-set stamp collection featuring the NHL Great Canadian Forwards, some of the greatest goal-scorers ever to play in the NHL. Sittler was highlighted among the most-talented group of star-forwards the NHL has ever seen. The souvenir stamp sheets resemble hockey cards and feature full images of the players in action. The backs of the stamps complete the hockey-card experience, offering stats that tell part of the player’s professional story. Sittler was one of six men featured in this unique stamp collection. This group was best known for their hockey talent, but were also beloved as men of honour and character who heroically represented the best of who we are as Canadians. In October 2016, Sittler was named 4th in a ranked list of the Top 100 Leafs Players of all time, as part of the season’s Centennial Celebrations. An important part of the Maple Leafs’ Centennial Celebrations was recognizing the accomplishments of the many skillful players from the past century and wearing their iconic sweaters. With so many legendary players, it was an extensive process but it was a labour of love for many, including the fans who submitted more than 300,000 votes online to create this very distinguished list. Although Sittler’s jersey number “27” banner had been hanging in the ACC since 2003, in October 2016, the number “27” was one of eleven numbers officially retired by the Toronto Maple Leafs in celebration of the team’s 100th season. In a dramatic ceremony to begin their Centennial Anniversary, the Leafs took a strong step toward bridging their storied past to a promising present and future. That evening created a historic moment for these Leafs legends and also for the fans who were there to help recognize these players in one of the most meaningful ways you can in the game of hockey. On October 24, 2016, Sittler launched his new auto-biographical book: ‘Captain: My Life and Career’, (co-authored by Mike Leonetti). This book illustrates the incredible life and phenomenal career of one of the greatest players ever to wear a Maple Leafs uniform, told through stories and never-before-seen photographs. On January 27, 2017, in a ceremony during the All-Star Weekend in Los Angeles, Sittler was named one of ‘100 Greatest NHL Players’ in history, as part of the Best Centremen from the 1970s. The list was created by 58 people, including media members, NHL alumni, and NHL executives. On April 24, 2017, in a ceremony at Rideau Hall, Ottawa, His Excellency the Right Honourable David Johnston, Governor General of Canada, presented the Sovereign’s Medal for Volunteers to 46 individuals and Sittler was among them. The Medal for Volunteers recognizes the exceptional volunteer achievements of Canadians from across the country in a wide range of fields. As an official Canadian honour, it also pays tribute to the dedication and exemplary commitment of volunteers. Sittler earned this prestigious award for his role as a committed volunteer with Special Olympics Canada since the 1970s. In this capacity, he has attended countless luncheons and breakfasts, and continues to support and promote the organization through television and radio appearances. Today, Darryl spends time working with Maple Leaf Sports and Entertainment Inc. in areas of Corporate Partners and in community relations. Sittler is an active Member of the Board of Directors of several publicly listed mineral exploration companies, and is also very supportive of a number of charities. 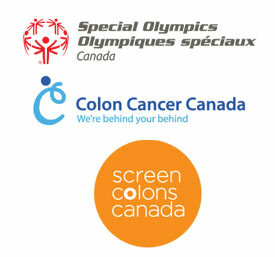 These charities include the Special Olympics Canada, Screen Colons Canada and Colon Cancer Canada in honor of his late wife Wendy who died from colon cancer in 2001. Sittler is also a Founding Co-Chair for ‘Have a Heart for Downs Syndrome’ (HHDS) a charitable, non-profit foundation whose mission it is to create opportunities in education, training, employment and housing initiatives in our communities, so that all people with Down syndrome can live full and happy lives. Individuals with Down syndrome should be fully accepted and integrated members of society, empowered to reach their full potential and enjoyment of life. To relax, Darryl enjoys fishing, bike riding, golf and spending time with family and friends.